Cartoons are a great way to express ideas. I’ve been teaching people to draw cartoons for over 20 years. Clients include the Society of Authors, Borderlines Literary Festival, Leeds City Art Gallery, Virgin Media, Blackpool Art Gallery, The Natural History Museum, HF Holidays, Higham Hall, schools and businesses. My workshops are aimed at beginners. 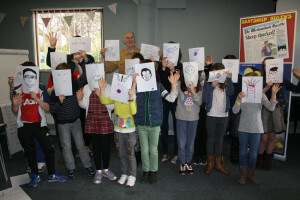 School cartoon workshops encourage children of all ages to refine drawing skills, approach art in a new way and add a visual dimension to a range of topics on the current curriculum. During a project in Wakefield, I worked with well-known author Tommy Donbavand to help 18 schools develop their own eBooks, featuring stories written and illustrated by year 5/6 pupils. LEARN how to draw simple cartoon illustrations to liven up PowerPoint. Tailored to the requirements of your business, this is a fun way to learn something different and make your presentations memorable. REWARD colleagues and clients with an entertaining workshop experience like no other! ENLIVEN YOUR CONFERENCE with a cartoon presentation of points raised and subjects covered, drawn live with no preparatory brief required. Whether you belong to an art group or haven’t drawn since school days, I can teach you to think and draw like a cartoonist. Learn how to simplify, capture the life and character of the world around you without all the fuss of perspective and realism! Book me now for talks or demonstrations. A one-day workshop at ArtisOn in Masham, North Yorkshire. This course is aimed at artists who would like a more relaxed approach to drawing, as well as anyone who wants to learn to cartoon. Book here! A two-day workshop at the fabulous Higham Hall, Bassenthwaite Lake, Cumbria. This a lovely location and the ideal place to spend a relaxed couple of days learning the art of cartooning. For full details and to book, click here.